I'm sorry about your deez nut, but stoked that you like the fiddle so far. Like I said, it is a very Nick guitar. Kinda bummed now...got a call from Parkway, they swapped the pots and input jack and it's working again I guess but the OG knobs won't fit the new shafts. I'm assuming it's a metric vs imperial difference but with a 50+ year old MIJ guitar it's hard to say if the original parts were standardized. I really wish they had at least contacted me first to ask if I wanted to try to source parts myself or if I was comfortable with modifying it at all. They suggested I may be able to affix the silver hats to a Gibson speed knob or similar if I want to keep the original look, but I think I'll probably just put some generic knobs on it and keep the originals for someday. One of the reasons I bought this particular guitar was because it was all original...first world problems I guess, just irks me because if it was a 1965 Gibson or Fender they would probably have made extra sure not to do anything to devalue it. Did you get the old parts back? Some pots can be restored to working condition. I didn't think while I was on the phone but called back an hour later and left a message that I wanted to keep all the original parts. Hoping for the best. Picked it up Sunday...they fortunately had some used knobs that fit the look pretty well, and yes, all original parts were saved! -The finish is actually a green stain with a thin clear coat. As a result, any little finish chips actually don't show at all from a distance. That said, the finish on this one is still very good with minimal dings aside from buckle rash on the back. The green finish is not done any justice in pictures, where it looks either black or PRS green. In person it's just so rich and deep. -There are these weird black plastic inserts in the F-holes to prevent you from dropping stuff (also dust, etc) inside the guitar. Probably also to reduce feedback. -The vibrato unit is so sensitive. The slightest touch and it acts like a spring. 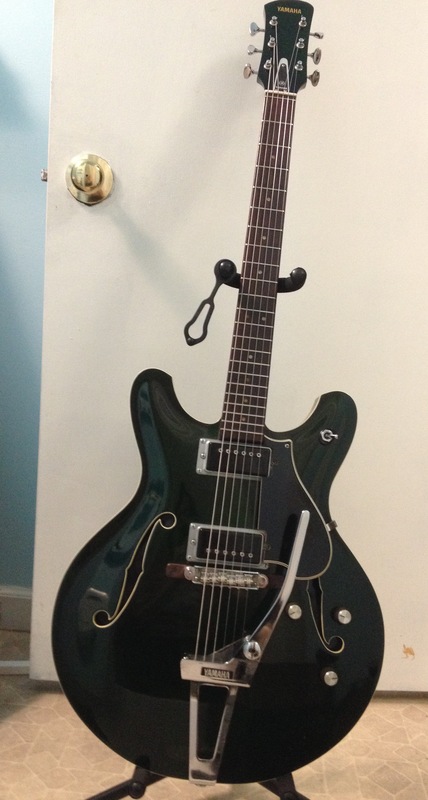 So much boing out of this guitar, but also can be controlled nicely like a normal bigsby. -The pickup rings are metal but not chromed. I love the look with the black pickups. -Not sure yet what the pickups are. I think I've read they might be hum sized single coils; they are hotter and a bit fuller than my strat but still very bright and clear. Not muddy at all so if they're hum buckers they're good ones, and if they're single coils, they're not too noisy at all! -Frets are tiny how I like them. -Neck is chunky but not too chunky. -It is pretty heavy, I read online it was full hollow but if that's true then the wood itself is really heavy. I think it weighs more than my Ovation. -It is also quite large. It makes my Ovation look weird and stubby by comparison. The big difference is how the Ovation's neck is set way further into the body to give the feeling of playing a smaller guitar, even though the bodies are similarly sized. -Constructionwise it feels kinda like if Rickenbacker tried to make an ES335. Likely due to how high the strings sit from the body due to the neck joint construction. The neck shape and similar headstock help with that association. I took some video with my phone but need to run updates to my computer before I can trim it down for an upload. That's lovely I love my Yamaha and this looks every bit as nice. Great stuff and nice work, Nick. 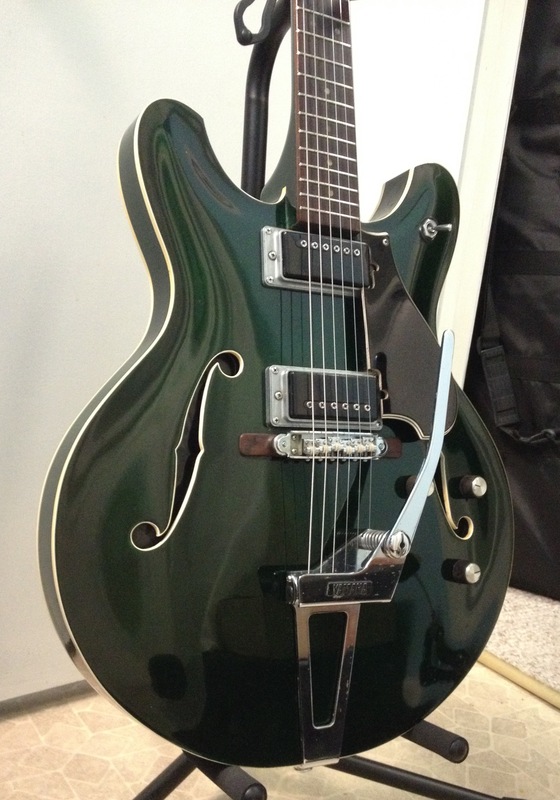 With the full-bodied tone and single-coil-like dynamics, it surprisingly sounds so much like my G6128T-DCM. Aces, busting-out Surfer Girl right out the gate too! The bridge pickup and/or recording makes it sound quite banjo-y; lots of attack but not much sustain-decay-release. Pretty nifty.